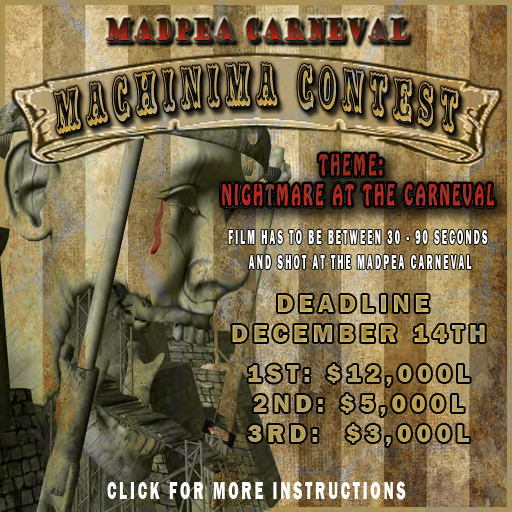 MadPea: Vote for the Machinima Contest Winner! Vote for the Machinima Contest Winner! The MadPea Crew has chosen 5 favorites of the contest entries. Now it is your turn to vote. All machinima are posted at our Facebook page. Please click LIKE if you want one of the films to win $12 000L. Voting lasts until Jan 4th, 12pm SLT. The one with most likes wins! Karima Hoisan and Natascha Randt - Where are you? A little girl got lost in the MadPea carneval and is seeking her daddy. A nightmare with an unexpected end! Strange people a MadPea carneval!